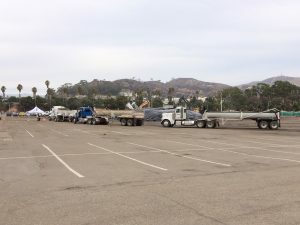 If you have been to Surfers’ Point lately you probably noticed the parade of trucks hauling mudslide debris to the Fairgrounds parking lot. The County of Santa Barbara got the necessary emergency permits to do the work. We are being told that the cleaner loads of debris are being placed directly on beaches in Carpinteria and Goleta. 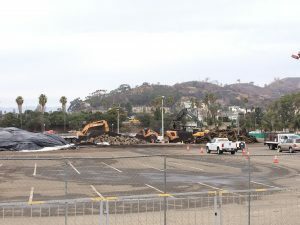 The loads that contain more rocks, wood, vegetation and other items are being trucked to two locations, including the Ventura County Fairgrounds. 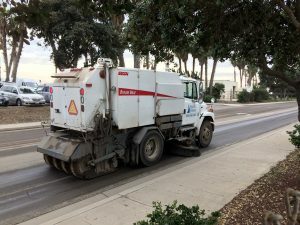 While it is quite alarming to see dump tucks backing up to the beach in Santa Barbara County and unleashing loads of mud, we have been in touch with Santa Barbara County Supervisor Das Williams, who is helping to ensure the proper process is taking place and no unnecessary harm is being done. The Santa Barbara County Health Officer has closed the beach ocean waters for public use until further notice: Gaviota Beach down the coast to the County line at Rincon Point due to high bacteria levels. On Tuesday, there were over 100 surfers in the water at Rincon and there were no signs posted on the Ventura side warning people of possible water quality issues that could impact their health. 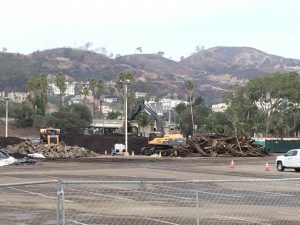 There are currently no comments from the County of Ventura on the mudslide debris being trucked and dumped just north of the Santa Barbara county line and possible water quality impacts. During the winter, ocean water testing is done once weekly with results posted on this site. The latest water testing day was 1/16 and they promise to have the results posted by 1/18 at 5pm. Does the contamination magically stop at the county line? Probably not, the currents are likely transporting the mudslide debris and associated bacteria north to south along the coast, especially with the strong NW swell in the water. We urge continued caution before entering the water in northern Ventura County and suggest that you avoid it. 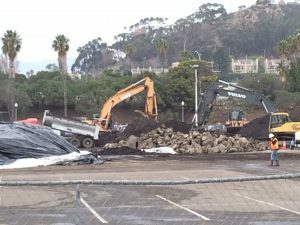 KEYT posted this story last week with an overview of the process. On Tuesday, they posted this story of a truck that lost it’s load of mudslide debris in Goleta. The Santa Barbara Independent also posted a story here. “Heal the Ocean has received numerous (some irate) phone calls regarding the mud being deposited on Goleta and Carpinteria beaches. Television media has also called for a response from us. We told them, and everyone else, we were investigating and would let everyone know when we knew the answer. We at HTO don’t believe environmental knee-jerk reactions help anything, least of all the environment. First, the Thomas Fire/mudslide is a disaster of enormous proportions. Possibly the worst since the Earthquake of 1925 took down the Potter Hotel. The 101 Freeway is still closed, and as this commentary is written, now closed indefinitely, because the workers, as they remove mud and debris, are carefully combing the water and debris for bodies of missing persons. More importantly, the decision to deposit mud on Goleta and Carpinteria beaches Is a decision not made lightly by the numerous agencies charged with dealing with this massive problem – including public works officials from the city and county of Santa Barbara, the U.S. Army Corps of Engineers, Cal Trans, and the contractors themselves. 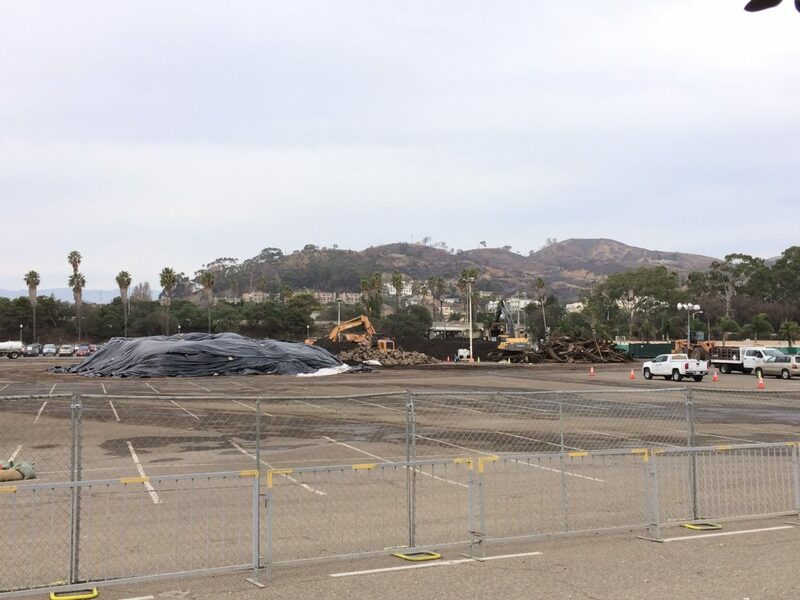 — Debris and vegetation is going to a site in Buellton and/or Ventura County Fairgrounds for holding until future disposal decisions can be made. Ventura County is helping. Many agencies that have weighed the options available to solve this massive problem are working night and day. Dogs are being employed to find missing people buried in mud and debris. Heal the Ocean asks all Ocean lovers and surfers (who should accept the fact they shouldn’t get into the water right now) to support the agencies working hard to get us out of this mess. And our thoughts and prayers go out to all those still searching for loved ones.